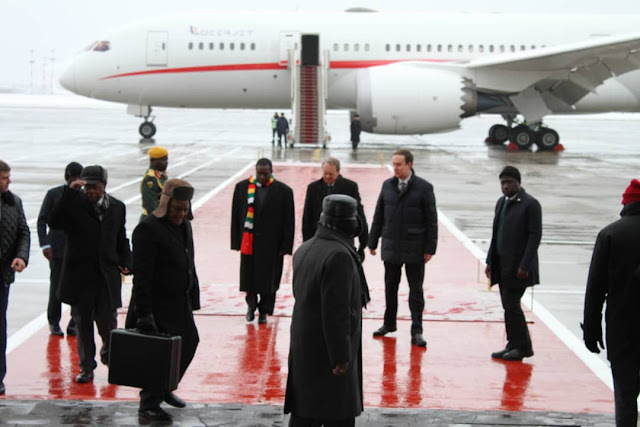 ANALYSTS yesterday ridiculed President Emmerson Mnangagwa’s five-nation tour of Eurasia at a time the country was imploding due to severe economic difficulties, as well as his penchant for luxury as he used an expensive luxury Boeing 787-8 Dreamliner aircraft for the trip. They said it was unnecessary for Mnangagwa to exhibit signs of profligacy by chartering a luxury plane – one of its kind – manufactured five years ago at a cost of £230 million and costs $74 000 per hour for hire until return, according to Business Insider, when the main reasons for mutiny yesterday in the country were economic hardships. Mnangagwa’s trips will cover Russia, Belarus, Azerbaijan, Kazakhstan and Davos in Switzerland, where he will be attending the World Economic Forum. Government claims that these trips will unlock economic value as the countries were more economically stable than Zimbabwe. Given that Mnangagwa will likely spend two weeks away, government could folk out US$25 million for hiring the plane in addition to hefty allowances for himself and his large entourage. Political analyst Rejoice Ngwenya said it was frightening that Mnangagwa would leave the country in its current state of distabilisation. “We know that Zanu PF has a history of intransigence and they do not have a conscience because it is frightening that he left the country in a state of destabilisation after announcing the fuel hikes – and how does he even know what is going to happen because there could be another coup being planned while he is away?” Ngwenya said. Ngwenya said the sad thing was that Mnangagwa thought that the problem in Zimbabwe was fuel only, yet there were a myriad other issues to be solved. “What is sad is that it seems as if his handlers and advisers are hiding things from him and not telling him the truth. What is actually going to happen is that during his trips, he is going to be inundated with journalists following him and asking him about the situation in Zimbabwe and the strike by civil servants. He goes on a trip carrying a large contingent to Russia, which will spend $2 million to $3 million when doctors are on strike; and foreign journalists are going to ask what he is doing there when his country is imploding,” he said. Another political analyst Earnest Mudzengi said Mnangagwa chose to travel against the backdrop of immense pressure to deal with the problems currently facing the country. “However, the fact is that as he looks at the problems, he might not have a solution for them from within, and he has probably gone outside to find solutions. The issue now is about whether he can realistically get some rescue from the Eastern bloc for those problems because the Western countries have been clear that they can engage Zimbabwe, but on condition that there are democratic political and economic reforms, which Zanu PF may not be willing to implement. “He thinks the Eastern bloc countries might be willing to co-operate without stringent conditionalities. So, Zanu PF might not be going to go to their full extent in terms of dealing with the real problem, and they might be dealing with the symptoms only, like the fuel crisis when it is just one area and it is a potential scene for creating instability. If they deal with the fuel situation they think that they have quelled the situation and yet its extent goes beyond that, to bond notes and other problems,” he said. Mudzengi said Mnangagwa’s hiring of expensive private planes were not only a Zimbabwean problem, but an African post-colonial problem where leaders wanted to live in luxury as long as they were in power. Zimbabwean academic at the Namibia University of Science and Technology lecturer Admire Mare said presidential trips could have been booked in advance, hence Mnangagwa could not have avoided proceeding with them despite the culminating problems in the country.